Nonprofit boards have struggled for years to develop effective board fundraising committees and strategies. According to the BoardSource 2012 Governance Index, 46% of nonprofit CEOs gave their boards “D” or “F” grades for their fundraising efforts and fundraising is the lowest ranked of 10 board board responsibilities. Simone Joyaux in a NPQ Newswire* raised some pertinent questions related to the “struggle to get the board to carry out its fund development role.” I have listed her questions below in bold. My overall response to her questions is that fundraising committees are not always necessary for effective fund raising! Where the committee is doing a poor job (graded average or below), it is best to cultivate and support a few board members to drive fundraising. 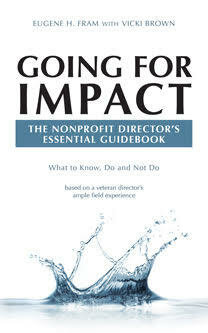 After all, not all nonprofit directors have a strategic orientation. •	Why do you want board members involved? For many nonprofit organizations, fundraising is a joint strategic responsibility for the board and management. Some bylaws even delineate the responsibility. In cultural, legal and strategic senses, it can’t be fully delegated to management, even when the organization employs a professional development staff. After all, the board is responsible for organizational strategies, and management is responsible for implementation tactics. For example, at the minimum, most foundational proposals will want assurances of board involvement in funding and that the funding is tied to the strategies for achieving mission. Without these elements in place, proposals can be viewed as being weak. Some funders may even want to meet with board members personally before and after providing grants. •	How does shared understanding and ownership add value? For many board members, board sponsored fund development involves discomforting, inconvenient and time consuming tasks, although they admit it is a responsibility. Consequently, they may not really understand the strategic value it adds (At a minimum, board policy needs to be clear about the task, even if some directors only need to be alert to providing potential leads to funding.) Those “drafted” for committee service often only ”tread water” by suggesting farfetched tactical ideas that preclude action. I once encountered a fundraising committee, which met monthly to try to develop an endowment fund, although the small agency involved did not have any volunteers who might assist. As a result, when the monthly meetings become repetitious, one director volunteered to take action and seek current funding by himself. Results; the committee disbanded, and the individual alone was able to raise about one-third of the agency’s yearly budget for many years. •	Do you hope to make this work fun for your board members? No! Making projects “fun” is for children! However, I think there should be a strategic effort for the CEO and Board Chair to encourage boards members who view fundraising as a meaningful activity, to accept leadership. Fundraising skills need a recruitment priority and need to be related to strategies. Simone Joyaux suggests that even with directors. “…who understand their roles, they don’t want to do ‘that fundraising stuff.” For an organization that wants to develop a fundraising dinner, they need to recruit board members or volunteers who have experiences in planning events. Similarly, if a number of board members work for large businesses, provide them with the tools to make personal approaches to their donations office to determine if the firm’s donations priorities are in line with the nonprofit’s mission. This becomes a time-limited contribution which many directors can engage, especially mid-career persons who live time compressed lifestyles. Boards are facing challenges with these types of directors. They do well on the time-limited projects, but they often lack real interest in the governance functions. My decades of experience with nonprofit fundraising show that one to three board individuals comfortable with fundraising can do much more than board standing committees, when the committee structure isn’t achieving a development potential. And the BoardSource percentages cited above certainly indicate overall substantial room for improvement. In the current century, volunteer directors focusing on the effort have significant problems devoting time to this continuing type of contribution. Consequently, it is best to try to recruit a few retired or semi-retired persons, who find development a meaningful activity, can proactively take action with board oversight, understand the strategic importance of the activity and become role models for newer directors. As my development friends tell me, “People Give to People.” I think standing board fundraising committees, although a preferred development approach, can get in the way of action-oriented progress and strategy development. Do you agree? •Simone Joyaux (2013) “Involving Your Board and Board Members in Fund Development,” NPQ Newswire, June 28th. Interesting article to read on board and fundraising. Thanks for your comment. This post has been out for quite a while. How did you encouter it? .